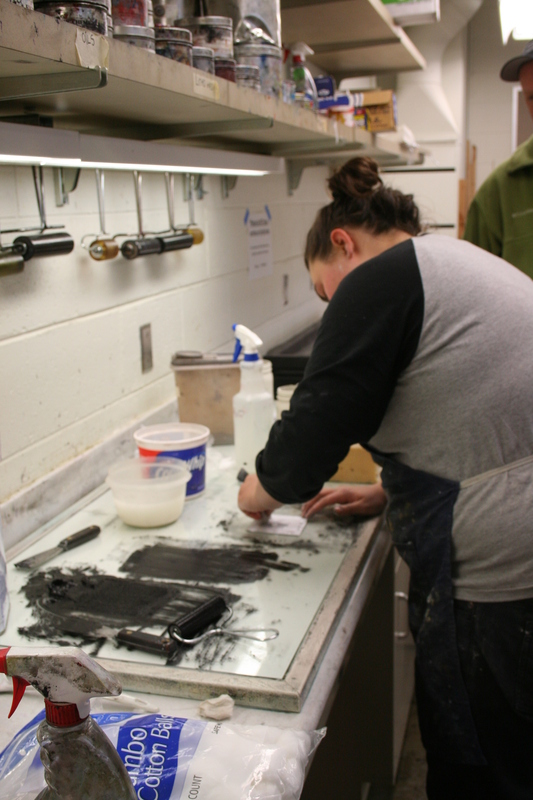 Just as I decided that paper was not too bad, Laura rocked my world by introducing the xerox lithography process on fresh, wet, greenware. Eric Henderson, Erin Anderson and I were salivating as Laura was showing us the techniques during class. It is very similar to the xerox lithography that you would use in printmaking. To begin, you need gum Arabic, black iron oxide/black mason stain, linseed oil, cotton balls, a printmaking brayed and some paper towels. Have some black and white xerox. Avoid greys in your images. Mix up some gum Arabic and water, till it gets soupy. You need to create your own ink, so mix up some stain of your choice and linseed oil, till it gets mucky. Prepare your xerox by dousing it in gum Arabic. This chemical repels the stain/linseed oil when soaked in the xerox paper. Ink up the plate enough where you can see the ink is on the black and is repelled from the white of your image. 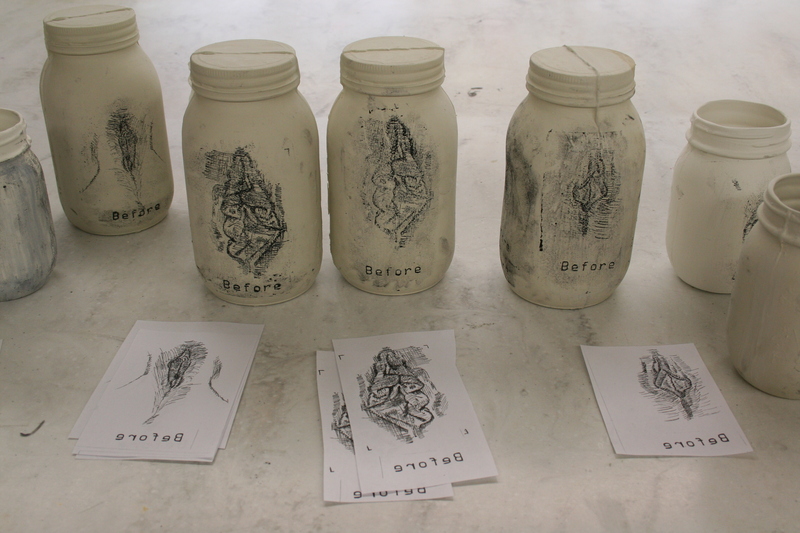 If needed, as some additional gum Arabic to ensure that the white areas are safe and clean. Erin is quite malicious when it comes to inking up clean lines. When printing on clay. 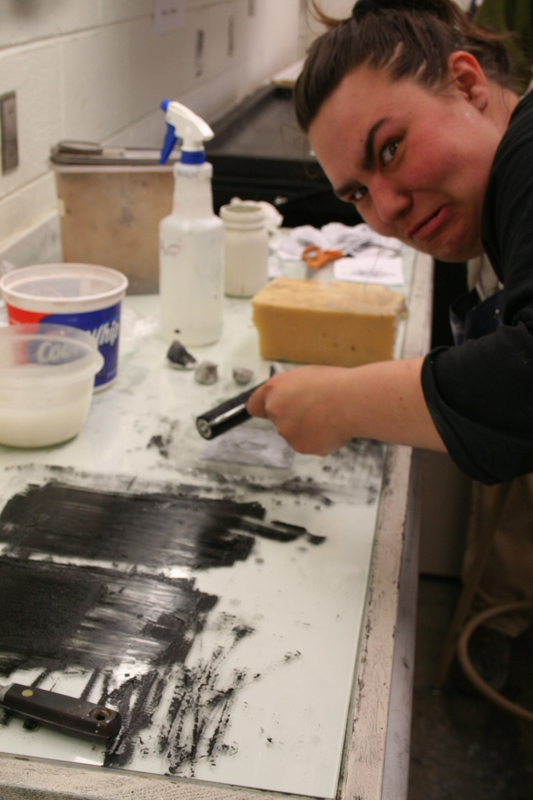 you need to make sure that the clay surface is free from texture and grog. You also want the clay to be soft and wet. Too dry, and the ink does not stick to the surface of the clay. Too wet, and the clay sticks to the plate. Either way, it can turn into a sticky situation. This is where the magic happens. I know, you are on the edge of your swivel chair wanting to know what comes next. And honestly, you have to wait for the plate to dry up. If the xerox goes on too wet, it transfers it’s moisture to the clay body and then we run into problem. 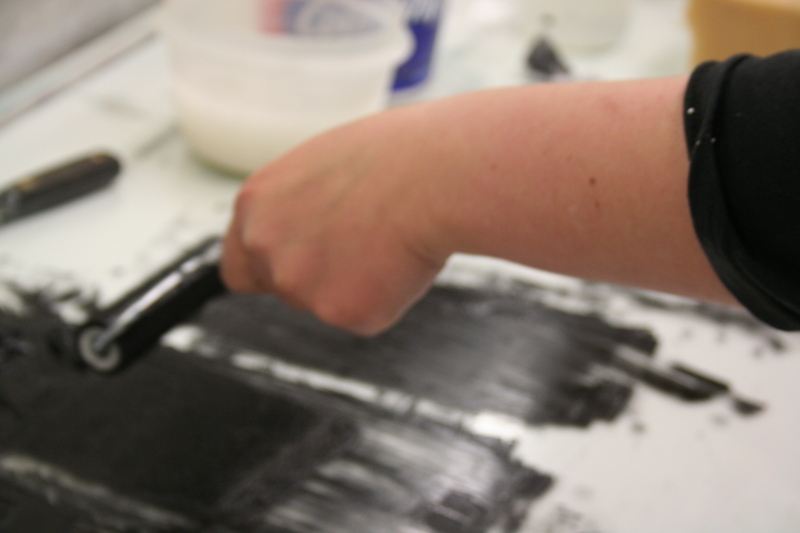 When all the gum Arabic beads dry up, pick up the plate and press it onto the clay. 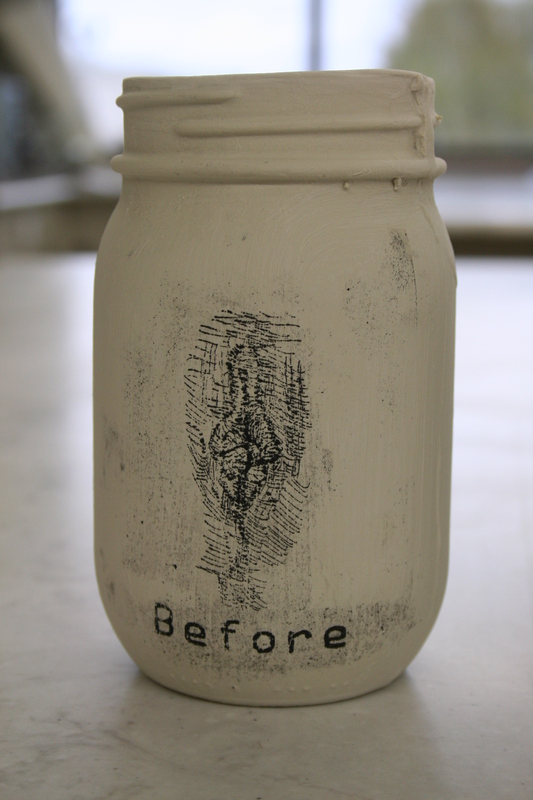 You can either use your hand, spoon, or rubber rib to press the inked image on your clay piece. 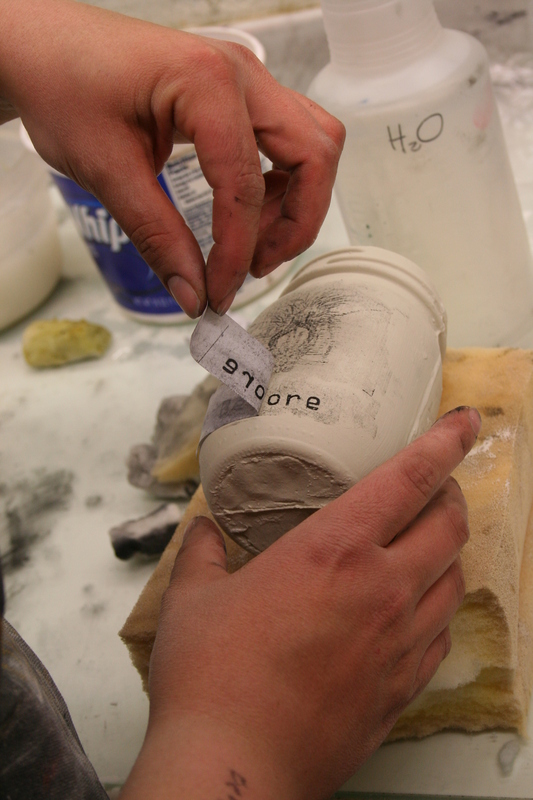 Last step is peeling away the plate to reveal the inked clay. If things went seriously wrong somewhere down the line, you can simply rib the stain off the clay and start over. I think this is a great process that Eric, Erin, and I have all gravitated towards. I find it interesting how different the three of us and Laura print on our pieces.